Happy July! We're excited to start a new month. At CSI, that means new challenges, new sponsors, and new guest designers. 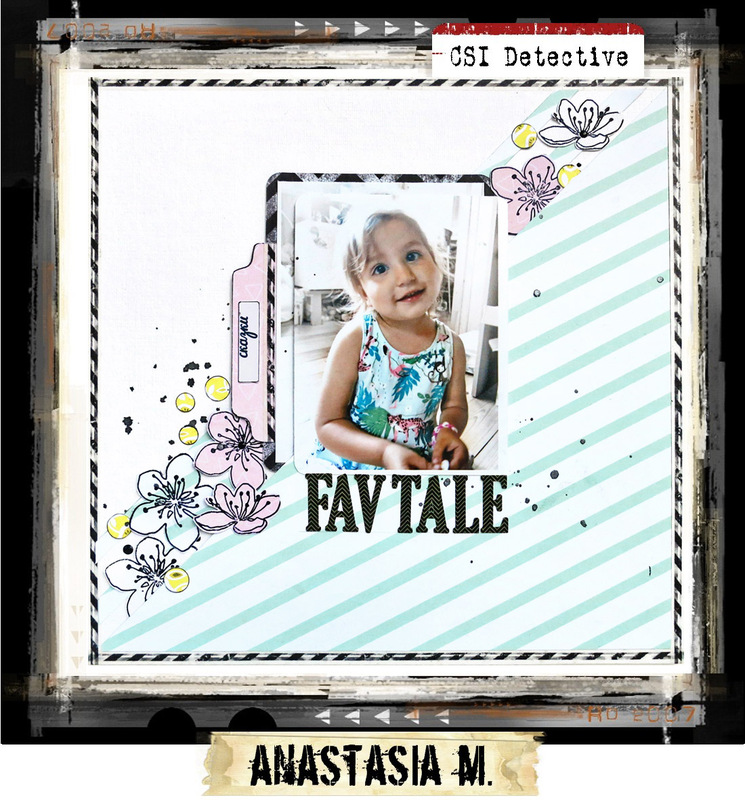 And this month our newest Detectives make their debut! So, are you ready for the new challenge? Grab you forensics kits, CSI players, and get ready for some serious sleuthing as we open Case File No. 257. 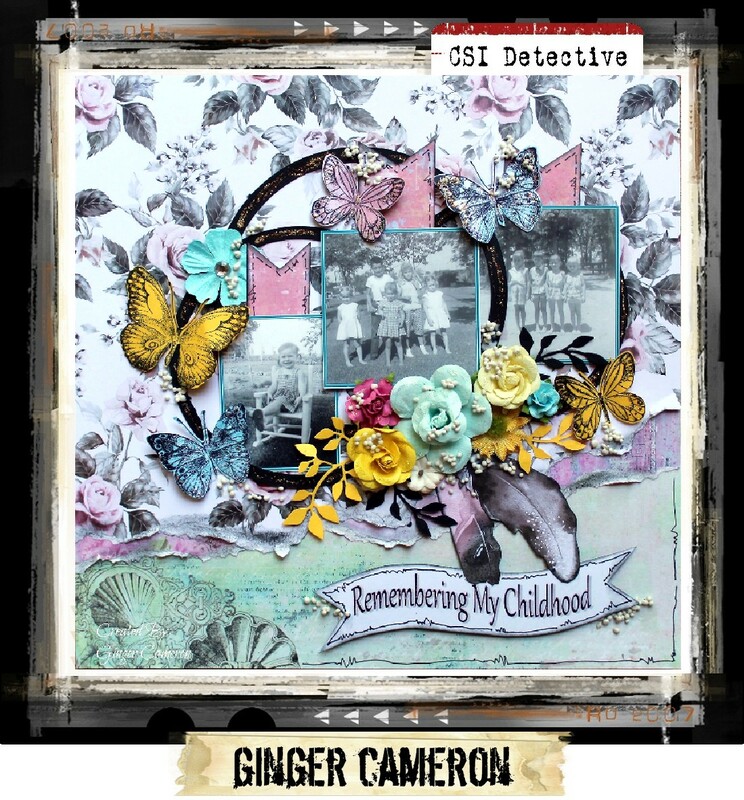 We are celebrating summer with our Case Files this month! To help us do that, we found this delightful Scene at Love Print Studio to inspire our Case File. 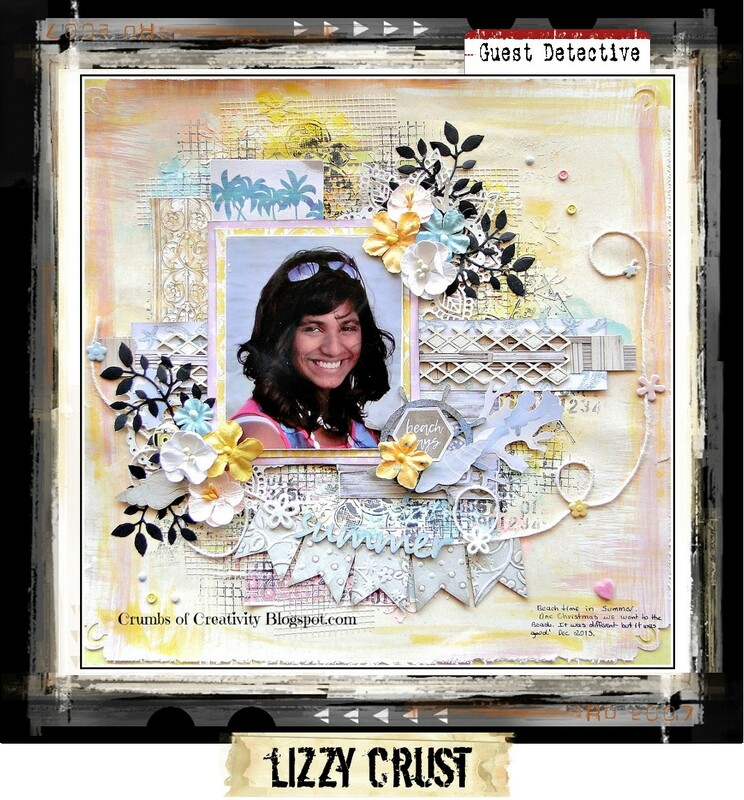 How Lizzy solved the Case File: I have used the colors and I have also used woodgrain paper, flowers, leaves, banner, string, quadrant design and tiny brads. 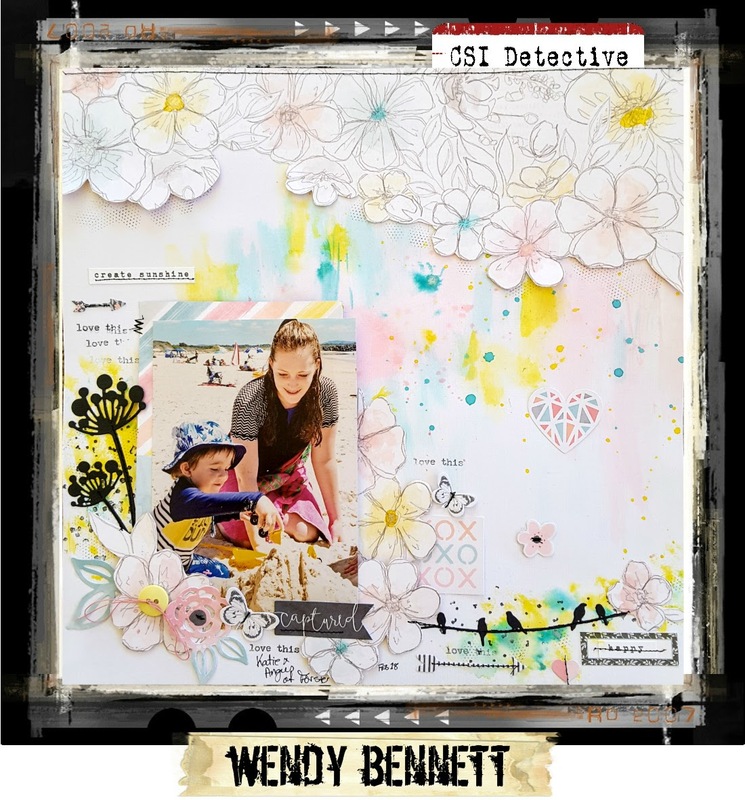 I have documented something about summer..
How Tania solved the Case file: My inspiration came from the Colours (gorgeous combo) I used Stripes and Flowers on my page. 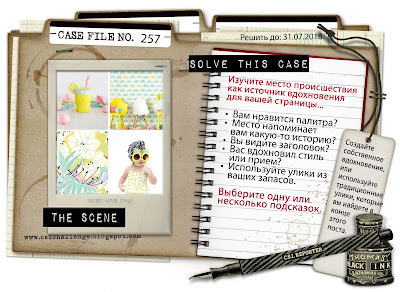 How Sue solved the Case File: I was inspired by the colours and also the cute little babe in sunglasses, the flowers, cloud paper, the circular shapes and the pops of black. How Raechelle solved the Case File: I was inspired by the colors, the lemon, the florals and the baby wearing sunglasses, so I had to use this adorable photo of my granddaughter which worked perfectly for this challenge. I added some floral pattern, plastic glasses (from a cupcake), lemon, thread, and brads from the Evidence along with the inspiration word, 'adorable' from the Testimony. 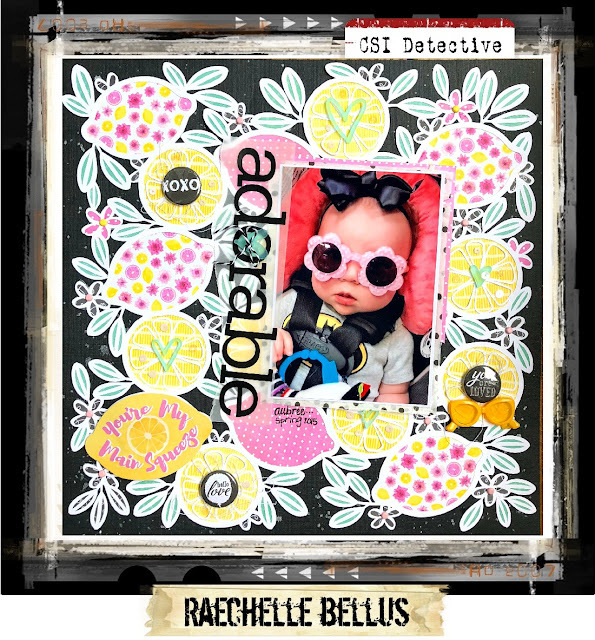 How Michelle solved the Case File: I was mainly inspired by the colours in the scene, plus I loved the yellow sunnies that the wee girl is wearing, so I used yellow in the circle at the centre of my cut file. I also took the dots in stamens of the flowers and sprinkled a little black here and there too. 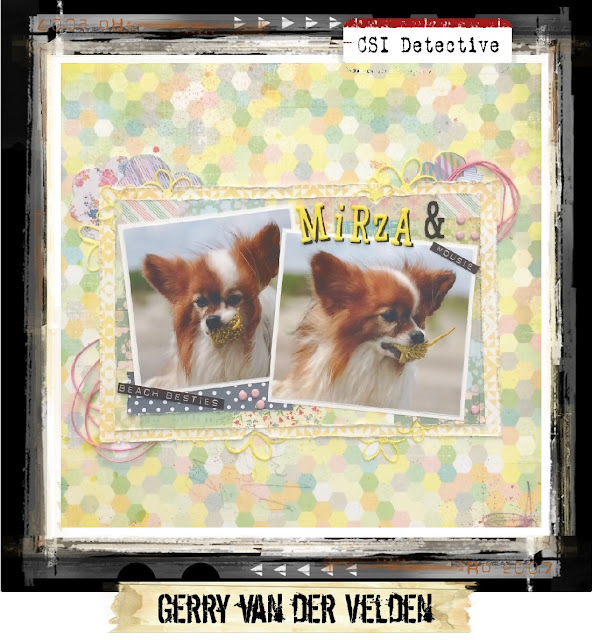 For this challenge I used pictures of my darling Mirza who’s favorite toy was a little squeaky mouse she loved to play with on the beach. 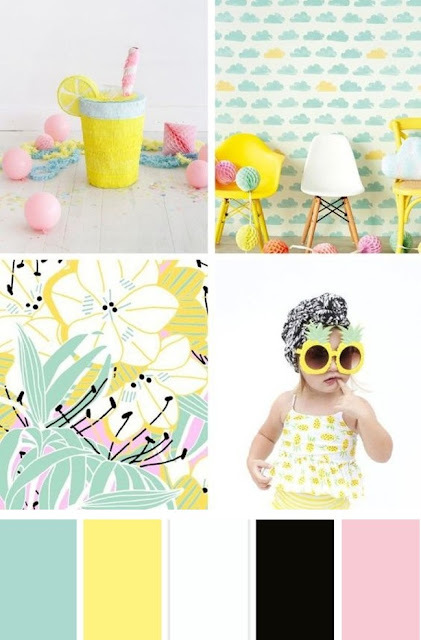 And yellow fits right in being one of the colours in this challenge. The papers had a bit of the colour scheme of the challenge in it that I only had to add a few embellishments to make it work. I used the florals pattern, stripes, flowers, clouds, almost black and white pattern which is actually dark blue😊some string and tiny brads and she is adorable to me anyway, have fun with this challenge! How Lisa solved the Case File: I was inspired by the colors. I used floral pattern, stripes, woodgrain, flowers/ leaves, a banner and tiny brads as evidence. I documented something summer. 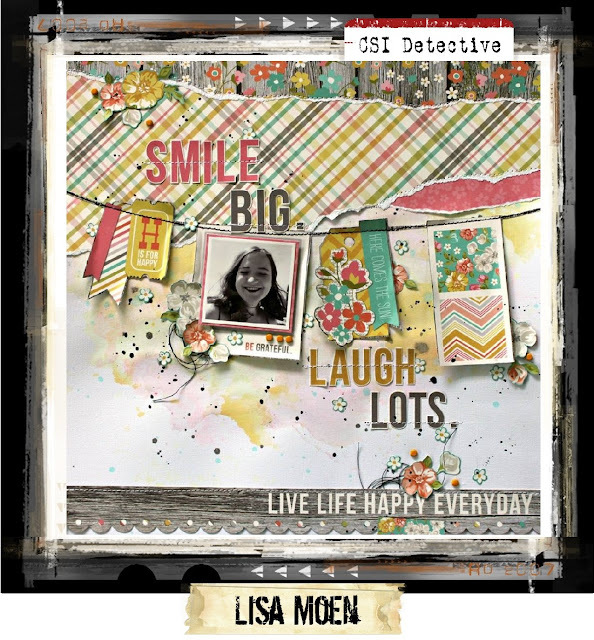 How Lisa solved the Case File: I was inspired by the circle shapes in the mood board, so I incorporated circles and also spotted paper. I loved how the black in two of the images were subtle - more like lines or highlights, so I used some of my layered chippie flowers to recreate this look. I loved how cute the photo of the little girl is, so I decided to dig up an old 'cute' photo of my daughter to use on this LO too. 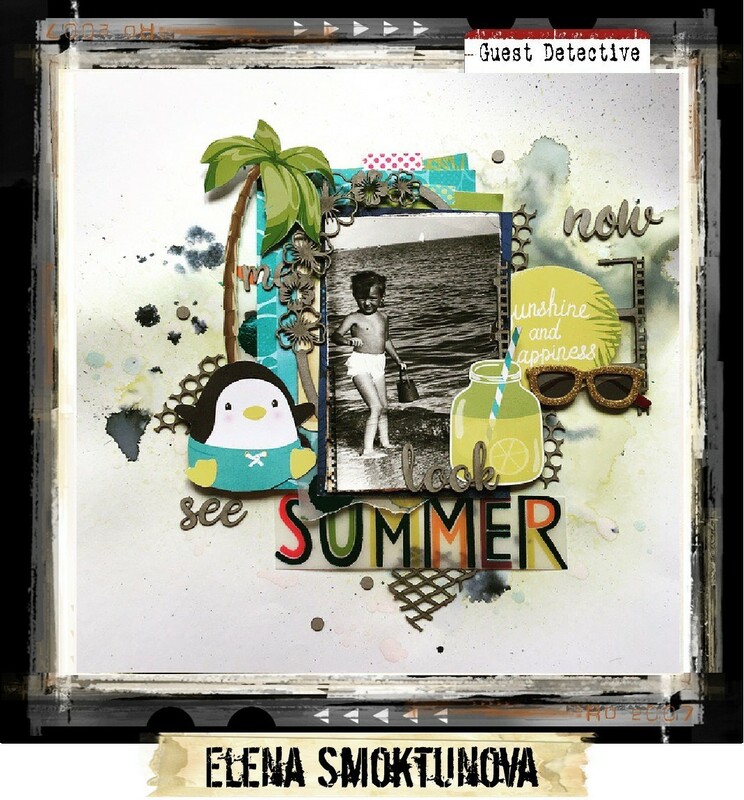 How Natsuko solved the Case File: I was mainly inspired by the colors and the summer theme. I wanted to create a beachy layout with my photo blending in with the background. The sand is made with natural sand textured paste and mica fragments. 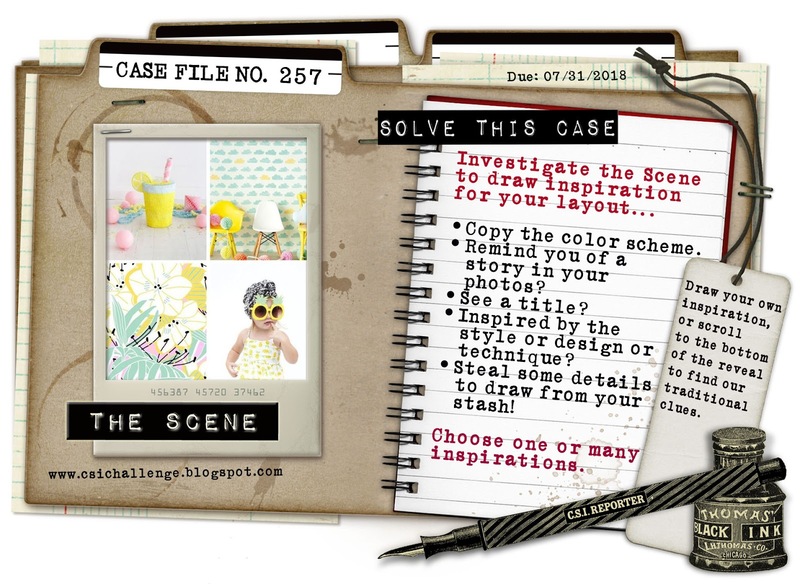 How Magali solved the Case File: I was inspired by the color combo, and I picked for the evidences, the stripes, the clouds, the black and white pattern and finally the tiny brads. How Carina solved the Case File: The photo of the little girl with the sunglasses reminded me about when the kids loved to play dress-up around the house. I found this photo of my DD and I thought it worked perfect! I also tried to pick up some of the colors from this file too - but I ended up with different shades though! I recently got the Simple & Sweet collection by Pinkfresh Studio. It was sitting on my desk, and when I got ready to start planning a layout for this Case File, it dawned on me that the colors perfectly matched the Case File. I added the blue that was also in that collection. I also used a few of the Evidence clues: floral pattern, wood, leaves, lemon, black and white pattern. I also used the Testimony clue about documenting something about summer. How Kim solved the Case File: I was inspired by the colors and the photo that had the ferns in it. I used Prima Havana papers. How Annie solved the Case File: I was inspired by the combination of black/white with zingy yellow and pastels in the inspiration image. I used some of the clues - leaves, glasses, stripes, b/w pattern, also picked out the pompoms just for fun. My journaling documents a happy summertime memory. 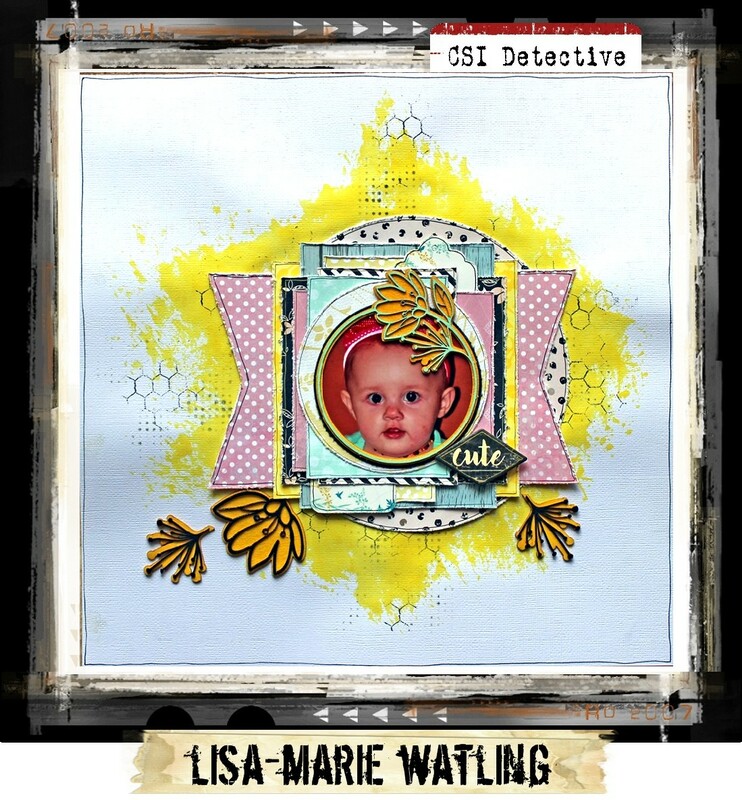 How Patty solved the Case File: I was inspired by a friendship of my daughter's. Also, I was inspired by the soft, pastel colors and how they seemed to pop off the page against the blacks of the background paper! How Ginger solved the Case File: I love the colors which reminded me of my childhood. The soft colors is such a reminder of days gone by! 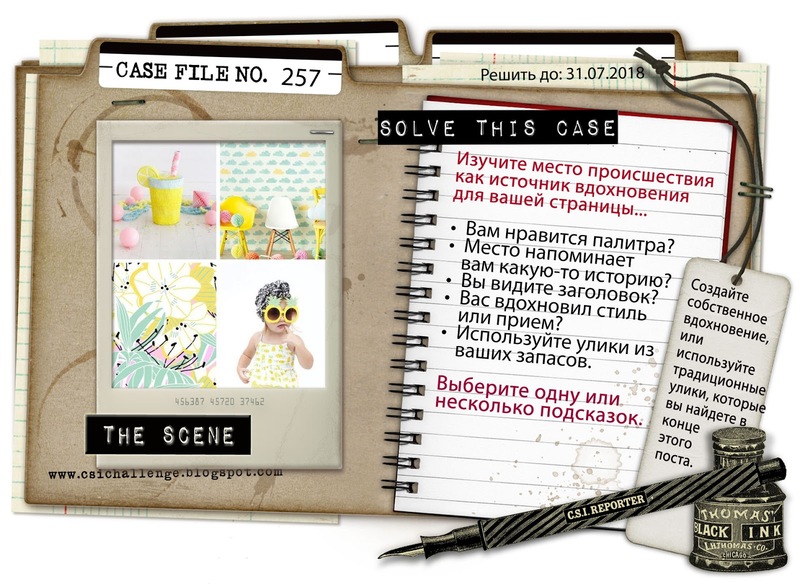 How Wendy solved the Case File: I was inspired by the floral pattern in the prompt. This Cocoa Vanilla paper seemed the obvious choice, the drink (in the photo prompt) made me think of splattering these adorable colours on a white background! The photo an obvious choice! SUMMER AT THE BEACH! How Libeeti solved the Case File: The real challenge for me was to make a boyish layout with such a feminine/girly inspiration case file! Anyway, when I saw the little girl with the sunglasses, it reminded me my youngest's photo, posing to the camera, with his sunglasses. That was the inspiration. 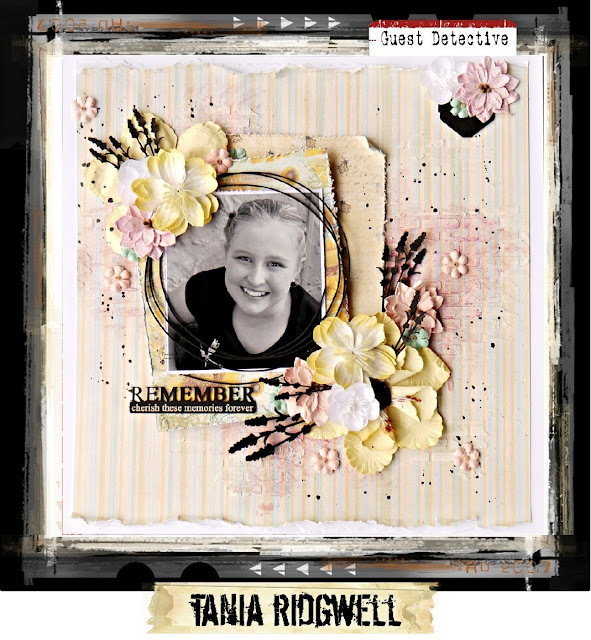 I've also used all colors, floral pattern, stripes (the torn papers), woodgrain pattern, clouds, b&w pattern and tiny brads (the little pink hearts). I documented a summer scene and I wrote my journaling on a circular journaling spot. 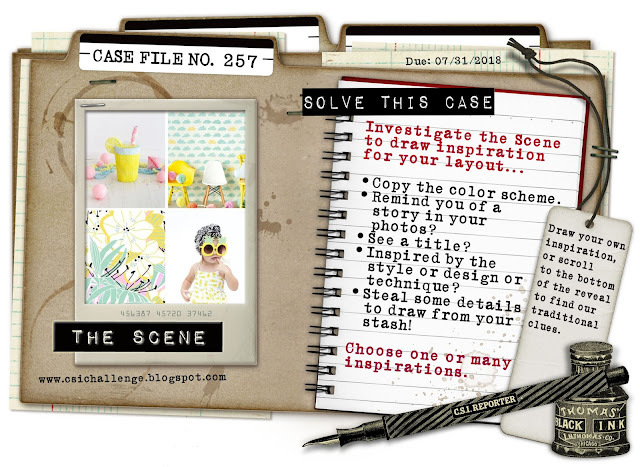 How Taru solved the Case File: My inspiration is COLORS and inspiration photo of challenge. 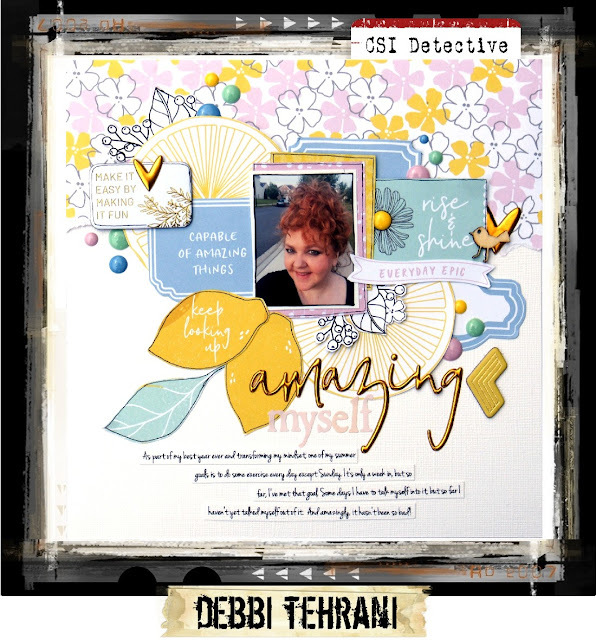 How Vivian solved the Case File: This layout was inspired by the pink paper with the word "Cherish" on it. I started working on this layout while watching a Vicki Boutin Friday Night Live video, and so I tried stenciling my background with a little white gesso. While not my usual technique I love how it turned out here. I also spent some time fussy cutting out the flowers from a different patterned paper. As per usual, I've used all the colours again, with the addition of a little green in the leaves of the flowers. Prompt Idea: Get inspired by these writingprompts. 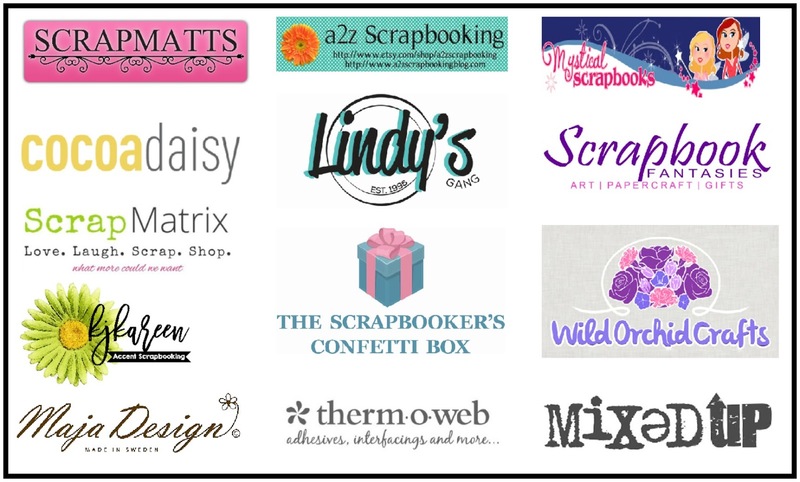 Presentation: put your journaling on a circular journaling spot. Writing Format: Write a 4-line poem—find inspiration and words to write off of from here. Hope to join you soon with some project, let me try for this gorgeous Case File.. Many of the layouts stand out, but Oh my the yellow by Laura Mooney really caught my eye. STUNNING!